One of the handgunning's most pressing questions has damned few solid answers. I touched on stopping power briefly in last issue's "On Patrol" column, but it's such a big topic of discussion I thought a lot of readers would be interested in a more in-depth presentation. 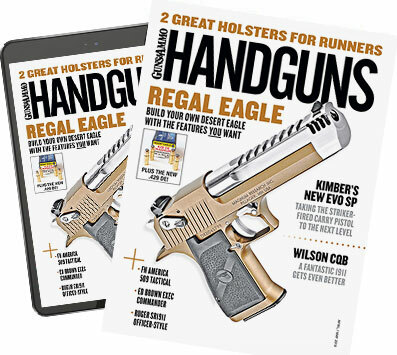 As I wrote last issue, I have long been interested in the topic of handgun stopping power. For almost 30 years, I've read everything I could on the topic. I've gone to autopsies, spoken with coroners and emergency-room physicians, interviewed people who had shot others in self-defense, and pursued shooting reports from many law enforcement agencies. I even wrote my master's thesis on the topic, which was a huge mistake. After all, part of a thesis is to draw a conclusion and defend it. How do you defend something that seems to defy a definitive pattern? My agency allowed me to use department letterhead to solicit shooting reports for my thesis, and major agencies across the country were very good to me. I received written reports, including autopsy data, from across the nation. The only thing these agencies requested in return were my results. And what did I discover or uncover? Not a darn thing. For every shooting in which a particular caliber and ammo combination worked well, I found another in which it failed. After all of the time and effort I spent on the subject, you'd think I'd have a good handle on the subject, but I don't. Many look to the ballistics laboratory for a definitive answer, but a human's resilience can't be re-created in a block of ballistic gelatin. Keep in mind that gelatin is calibrated against swine tissue, and even though swine tissue is very similar to a human's, it is not the same. Furthermore, no human being is a 100 percent consistent, homogeneous substance. We are muscle, fat, bone and so forth. What is definitive regarding the subject? We know handgun ammo is not long gun ammo. Rifle ammo travels much faster than does handgun ammo, creating a hydrostatic shock wave--an effect that can damage tissue beyond the area the round actually comes in contact with. Shotguns launch rounds that strike the body with multiple projectiles at once, creating an overload shock to the system. Or they can deliver one large, heavy chunk of lead weighed in ounces instead of grains. Multiple hits at once or overly large projectiles cause incapacitation, to say the least. Unfortunately, no handgun round will perform at this level. Typical handgun ammunition must contact tissue or a vital organ in order to disrupt or damage it, which means that for a handgun projectile to cause physiological incapacitation, it must hit something important. "Something important" includes the brain, heart or major vessels that will rapidly leak blood and lower blood pressure, which will eventually result in loss of consciousness--"eventually" being the operative word. This means pistol fire must be more accurate than rifle fire, which is a tall order considering the handgun's short barrel, limited sight radius and fewer points of body contact that help stabilize the gun when it's fired. The truth is the handgun is portable but not really effective. Some say to "use the handgun to fight your way to a long gun," but in the time frame of a typical armed confrontation, how likely is that? And don't expect the handgun to work with only one or two rounds, regardless of caliber and especially against an opponent high on drugs or pumped full of adrenaline. What about caliber? Is one better than another? Common sense dictates a bigger bullet is a better bullet, but a bigger bullet is also a heavier bullet, which means it will deliver more felt recoil to the shooter. Yes, recoil can be controlled with proper training, but how often do you train? I know that the majority of law enforcement officers train with their sidearms only when required, but what about the legally armed citizen? Even if he or she wants to train more often, gun clubs and public ranges are justifiably concerned with liability and safety issues, and that limits what skills a person can practice. As a general rule, rapid fire, drawing from the holster, movement and other related skills are banned. Most of the time, the gun is lifted, fired slowly and then "benched" in the interest of safety. What good is that? This being the case, we need to take recoil into account. Multiple shots that miss the target are like not shooting at all, and additionally these misses pose the risk of traveling down the street and hitting an innocent bystander or passing through a wall and injuring a neighbor. In the eyes of the community, those unfortunate errant rounds will be the only rounds fired--regardless of how dire the situation the shooter was faced with. Can added speed make a smaller bullet more effective? Sure it can. Picture a pickup truck hitting a wall at 25 mph and a VW Beetle hitting the same wall at 50 mph. A smaller, faster bullet can do considerable damage, but only if it slows inside the body to deliver its energy to the surrounding tissue. If you're restricted to using full-metal-jacket ammo (as the military is), using a fat, slow-moving bullet makes more sense because it has a greater chance of slowing in the body, "dumping" energy and reducing over-penetration hazards. A smaller projectile traveling at great speed can zip in and out of the body like someone stabbing tissue with an ice pick, damaging very little along the way. Such a bullet must be designed to deform, stop or at least slow dramatically before exiting the torso. Take the 9mm, for example. It can be a good choice for some, but history has clearly shown that it is load dependent--requiring a hollowpoint bullet of reasonable weight driven at a high velocity. For many, the 9mm is a wise option due to the reduced recoil it offers over the larger bullets of calibers .40 and higher, but only with carefully selected ammunition. ove the human element--one's ability to hit while in conflict--and look at the science alone? Compare the best 9mm load with the best .45, and you will find that the final wound cavity is between 15 to 20 percent larger for the .45. This would settle the argument that a bigger bullet is better than a smaller bullet when it comes to doing damage. Now for the bad news: As I pointed out last issue, this 15 to 20 percent is not enough to make up for poor shot placement. Remember, the larger and heavier the bullet, the more felt recoil will be generated which will result in greater shot to shot time unless you are well-trained and practice. Only the individual can decide if this added felt recoil is important when selecting a carry gun. So you see, when it comes to a realistic discussion of handgun stopping power, the human element can't be removed. As I mentioned earlier, I began to collect shooting reports as part of my master's thesis, and I have continued to do so over the years. It was never my intention to use them to create some type of stopping power "formula"; I merely wanted to know what worked and what didn't. So please do not read this as "Dave Spaulding's Manifesto on Bullet Effectiveness." It is not, and I wouldn't even try. What I have seen over the years, though, is that certain "formulas" of handgun ammunition work better than others, and they are listed in the accompanying sidebar. These trends or formulas have proven successful time and again. No, they are not absolutes as there are just too many outside factors that skew any type of incapacitation prediction. However, if the shooter does his or her job and places the round in a vital area, these formulas have proven to work. Here are the handgun ammunition formulas I've seen work well in the street over time. .38 Special 158-grain all-lead hollowpoint. Made by all of the major manufacturers, this may be the most proven load in law enforcement history. Another good choice is the Speer 135-grain Gold Dot hollowpoint +P as specified by the NYPD for the two-inch revolver. Available commercially, this round has proven to be very good in a number of shootings. 9mm 124- to 127-grain hollowpoint loaded to approximately 1,250 fps. This bullet is heavy enough to penetrate deeply and moves fast enough to ensure expansion (at least as much as anything like this can be assured) and deliver energy to the body. The most proven 9mm load: the Winchester 127-grain +P+ SXT hollowpoint moving at around 1,300 fps. This is a "police-only" load, but I have seen it sold on line and at gun shows. Friends in the NYPD tell me they are very happy with their Speer 124-grain +P Gold Dot hollowpoint duty load while Winchester's newer 124-grain +P hollowpoint is also doing well in actual shootings and is for sale to the public. Federal offers its HST hollowpoint in a 124-grain +P version, which has also done well. .40 S&W 155- to 165-grain jacketed hollowpoint moving at 1,100 fps or faster. All of the major manufacturers make a load like this. The U.S. Border Patrol has conducted extensive testing with this load using both the Federal and Remington versions in the lab and have had good results on the street--and in the desert, which is good to know considering the considerable threat these men and women face daily. Speer Gold Dot and Federal HST appear to lead the way. .357 SIG 125-grain hollowpoint moving at 1,350 fps. The Speer Gold Dot and Federal JHP loads are the most proven in the field. Others are available, but I do not have any hard data on them. .45 ACP 200- to 230-grain JHP. The Federal 230-grain Hydra Shok hollowpoint is the most proven. The Remington 230-grain Golden Sabre hollowpoint and Speer 200- and 230-grain Gold Dot hollowpoints have also worked very well. In addition to these formulas, my research and experience has led me to draw some conclusions regarding caliber and ammunition choices. First, relying on anything smaller than a .38 Special is less than wise. Yes, I know that the .380 is enjoying a high level of popularity, and there are a few good ammo choices in this caliber. But while smaller calibers can certainly prove lethal, reports have shown they cause less incapacitation than those of .38 Special caliber or larger. People shot with a good quality .38 (and larger) rounds tend to react to their impact: They notice. Those shot with lesser loadings may not even know they are hit unless the bullet violates a vital organ. I have seen suspects shots with .22, .25 and .32 rounds and stay mobile as if nothing has happened. Over the years, I've seen a number of law enforcement agencies change ammunition because of a single incident, which is not a good idea if the original-issue ammo was extensively tested and evaluated. No single event is a good indicator of overall performance because, again, there are just too many factors involved in any shooting. History is the best indicator of future performance. What does it all mean? Ammunition that fails to stop an adversary is usually due to poor shot placement and not poor ammo performance. Expansion is a means to an end--not the end result. You're better off with a bullet that failed to expand but hit a vital organ than with a fully expanded bullet that did not hit anything important. Remember, in order to be effective, handgun bullets must strike a vital location, and no amount of expansion or bullet diameter will change this. The best thing anyone can do to ensure his or her ammo incapacitates a dangerous attacker is to train hard to hit vital areas of the body while bobbing, moving and weaving as would happen in a real fight. This means training time and ammunition, and no super-duper, thermonuclear +P+, thunder-flash, wonder hollowpoint will make up for this. It also means using targets that represent real human anatomy and how the vital zones will change as the body twists and turns. It is wise to remember that an opponent will not always be facing you head on as targets do on the shooting range. As Col. Dave Grossman so wisely stated, "Amateurs talk hardware (equipment) while professionals talk software (training and mindset)." If you don't believe this is the case, take a few moments and look at some of the gun forums on the internet. You can't help but notice that the threads related to gear are full of commentary and debate while the training threads remain largely unused. Let's face it: Gear is fun while training and practice require time and effort. individual bias--and then making an informed decision. One of my favorite stories comes from Bert DuVernay, chief of police in New Braintree, Massachusetts, and the former director of the Smith & Wesson Academy. Bert had the opportunity to speak with Dr. Vincent DiMaio, one of the nation's foremost experts on wound ballistics, in regards to what constituted handgun stopping power. What Dr. DiMaio told him was the best piece of advice on the subject that I have ever heard: "The secret to handgun stopping power remains where you shoot your opponent and how many times you shoot them."